Note: The section of the trail to be paved is roughly that from the Route 30 Bridge, northward along Chiques Rock County Park. 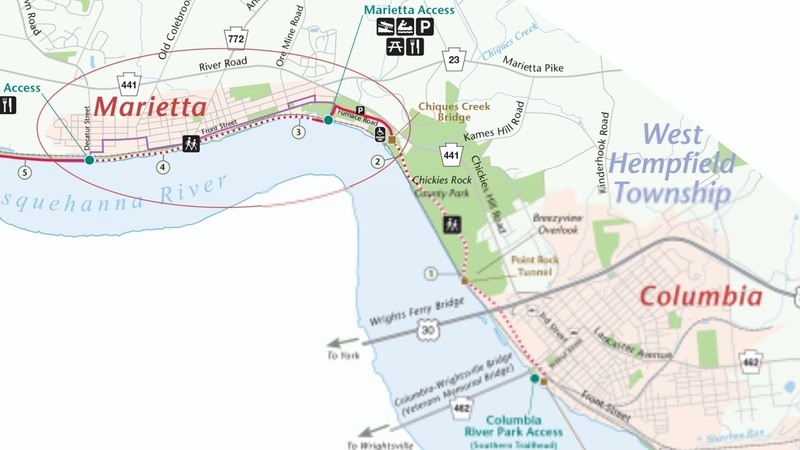 Sources tell Columbia Spy that a section of the new Northwest Lancaster County River Trail - from Columbia to Marietta - will be closed for about two weeks for asphalt paving beginning on May 11. Paving will be overseen in part by Lancaster County Parks and Recreation. At this point, it is undetermined whether or not the trail will be open on weekends during that time. Paving was originally scheduled to begin in mid-August but was moved up in anticipation of National Trail Days Celebration on Saturday, June 4. This all sounds good, We like the idea about the benches, but who will be paying for the maintenance of the porta potties? I mean come on, nothing is for free! Someone has to pay somewhere!! The Tax Payer gets hit again for the bill? After all we aren't going to live on the trail. Who is doing the paving on the trail?? Love the ideas but how long until the teens write all over them and ruin them. They vandalize everything in this town. It's the woods, enjoy nature. Rough it a little! Cripes.. next thing, somebodies gonna want free wifi & electrical outlets along the trails! What, no wifi along the trail. No phone charging stations either? Very poor planning. How can anyone expect to enjoy nature without having a phone shoved in their face the entire time? Trail paving is being done by Lancaster County Parks Dept. benches for elderly, those who can walk but not for miles at a time, those with babies, etc. water co should be repaving the back area of their new building. for $8.50 a month for 10 yearsd thats the very least you can do.